All these summer farm-fresh vegetables. They are so wonderful, providing an almost endless muse of cooking inspirations. But...enough already! I'm getting a little tired of it, frankly. So this week, I'm turning my back on locally raised vegetables and indulging my sweet tooth instead. 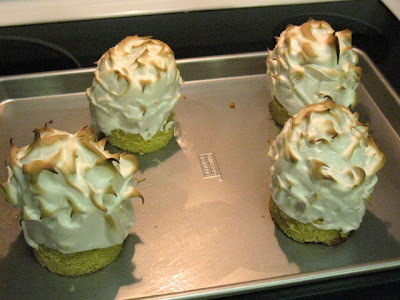 This baked Alaska recipe is the first of two I'll share this week that combine concepts from my current two favorite dessert-makers: Christina Tosi, executive pastry chef of Momofuku Milk Bar (and winner of this year's James Beard Award for Rising Star Chef), and Jeni Britton Bauer, purveyor of Jeni's Splendid Ice Creams. Chris is from Southern Maryland, so we occasionally go there to visit his family. Most of the restaurants in that area are national chains, but there is one local place that we really love, Casey Jones. Their menu is pub fare done really well: pizza, sandwiches, salads, etc., with an attached fine dining restaurant, The Crossing, which has a more upscale menu. The first time Chris took me to the Crossing was my first exposure to baked Alaska and I loved it. I thought it was the coolest dessert: a piece of chocolate cake sitting under coffee-chocolate chip ice cream surrounded by a spiky toasted meringue. I was instantly taken with it and worked to replicate it at home. My first attempt was a disaster. I didn't follow the instructions to freeze the dessert at every step. Plus, I'd never made a meringue before, so I had no concept of "stiff peaks" and stopped well short of that. The oozy mess I served (with company no less) was tasty, but not what I was going for. 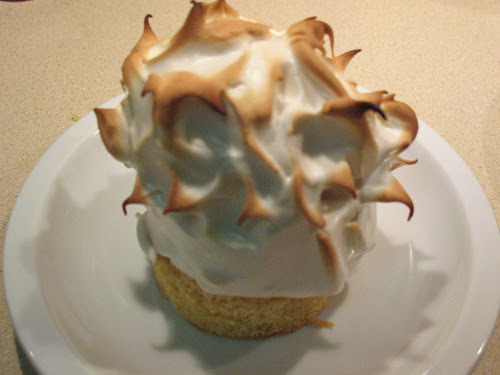 Over the years I've had more practice and eventually made good baked Alaska, but it has been years since I've done it. A recent dinner party for a friend who grew up in Alaska seemed like a good opportunity to try my hand at it again. For the flavors, I wanted to do a "breakfast at dessert" sort of theme and was intrigued by the "cereal milk" ice cream made by Momofuku Milk Bar. The idea to churn out an ice cream inspired by the tasty milk dregs from a bowl of kids' cereal is genius. For mine, I went with one of the most potently sugary kids' cereals: Cinnamon Toast Crunch. It just screams breakfast, combining cereal and toast into one delicious treat. To drive the point home, I wanted a brown butter cake for the base (since that's kind of like toast, right?) and a hint of coffee in my meringue. In making the ice cream, I went with the tried-and-true formula of Jeni Britton Bauer. No, she doesn't have a "cereal milk" recipe, but her formula is so versatile that it's easily adapted to whatever flavors you're interested in. Hoping to impart an optimal amount of flavor, I ground the cereal a bit and then heated the milk before steeping it. This has the added benefit of breaking the cereal down quite a bit, making the milk really thick. Straining it is a bit of work then; be sure to use a spatula to press and stir the milk-cereal mixture to get out as much milk as possible. I used 4 cups of milk and worked really hard to get 2 cups of cereal milk, since the cereal "sludge" absorbs a lot of milk. I used the meringue recipe I had originally turned to years ago from Epicurious, which produces just the right amount of meringue to coat all four ice cream cakes. 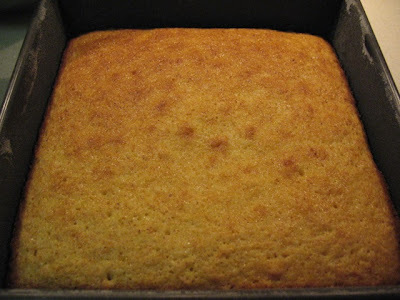 The cake I just found online from the Honey & Jam blog, as I was seeking a simple brown butter cake recipe. 1. Make a brown butter cake (recipe below). Using a 4-inch round cookie cutter, cut cake into four rounds. Eat cake scraps immediately. 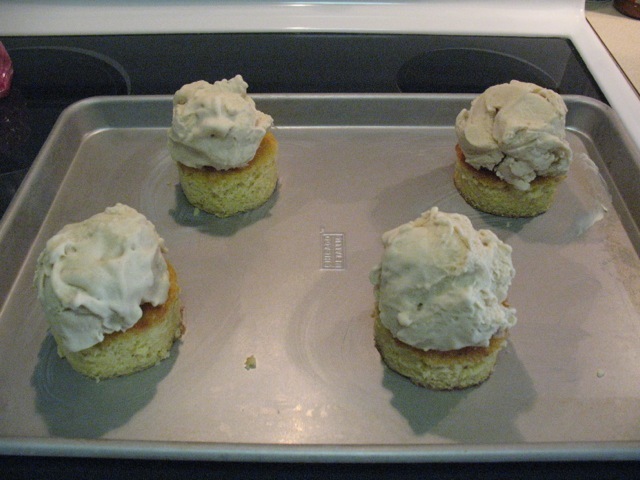 Place cake rounds evenly spaced apart (4-6 inches apart) on a greased baking sheet. Put in the freezer until cake is frozen. 2. Make Cinnamon Toast Crunch Ice Cream (recipe below). When ice cream is frozen, scoop 1 even scoop on top of each frozen cake round (if the ice cream is too hard, let it sit out for a few minutes, but make sure it doesn't get too soft). Put back in freezer until ice cream is frozen hard. 3. Using a stand and hand mixer, beat egg whites until foamy. Add the cream of tartar and beat until soft peaks form (dip a spoon into the meringue and a short peak will form that folds back down). Beat in the Kahlúa and then gradually beat in the sugar. 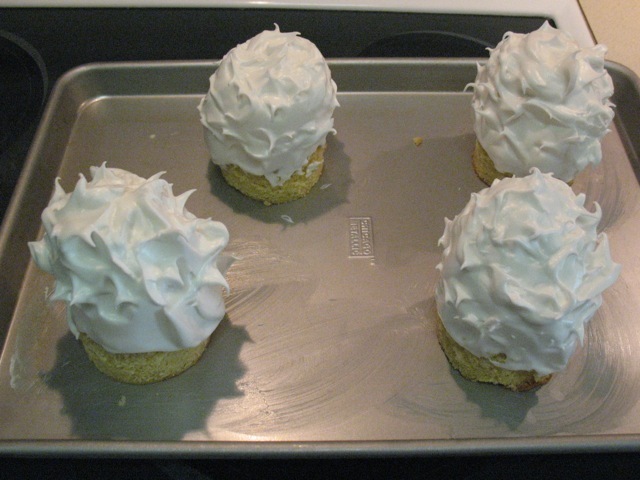 Continue beating until stiff peaks form (the meringue will appear glossy, dip a spoon through it and a peak will form that does not fold back down). Be careful not to overbeat. 4. Remove the frozen ice cream cakes from the freezer and use a spatula to spread meringue evenly over the ice cream, sealing the meringue against the cake. If desired, use a spoon to make decorative spikes. Put back in the freezer until well frozen (not sure how long is needed--I froze mine for 5 hours and it was fine but Epicurious recommends overnight). 5. 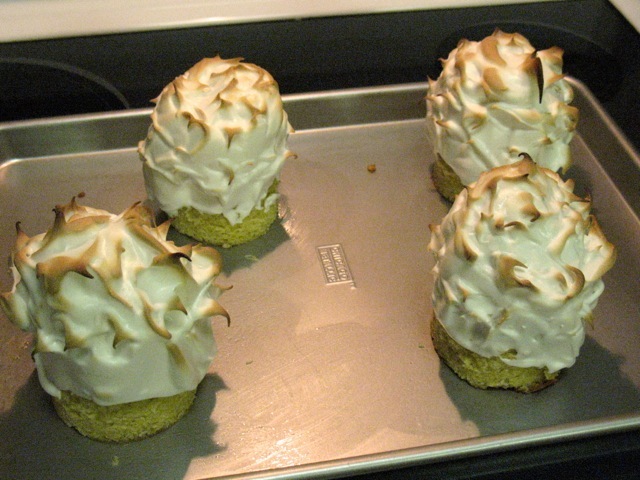 Adjust oven rack to center position and preheat oven to 500 F. Bake desserts until meringue is set an lightly browned, about 3 minutes. Serve immediately. 1. Heat a small saucepan over medium heat, add butter and cook until it turns a fragrant, nutty brown. Remove from heat. 2. Preheat oven to 350 F. Butter, line with parchment and flour a 9 x 9 inch cake pan. 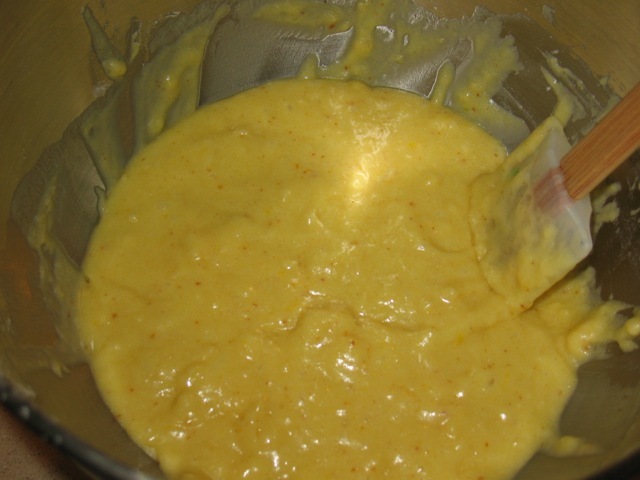 Beat eggs and sugar together until slightly thickened. Add milk, vanilla and brown butter, beating until combined. Add flour and baking powder and combine with a spoon until just mixed (some lumps are okay). Pour batter into prepared baking pan and bake until a toothpick inserted in the center of the cake comes out clean, about 25-35 minutes. All cake to cool completely. Run a knife around the edge and invert the cake to remove it from the pan. Discard the parchment. 1. Pulse cereal a few times in a food processor to break it up a bit. In a large (4 qt.) saucepan, heat milk and cereal over medium heat until it starts to bubble, remove from heat and allow to "steep" for about 30 minutes. Strain cereal mixture, pressing with a spatula to get out as much milk as possible, to yield about 2 cups (add extra whole milk if you end up with less than 2 cups). 2. Whisk together cornstarch and 2 tablespoons of the cereal milk in a small bowl. Whisk together softened cream cheese and salt in a large mixing bowl. Have a large bowl with ice water and a large (gallon) freezer bag ready. 3. 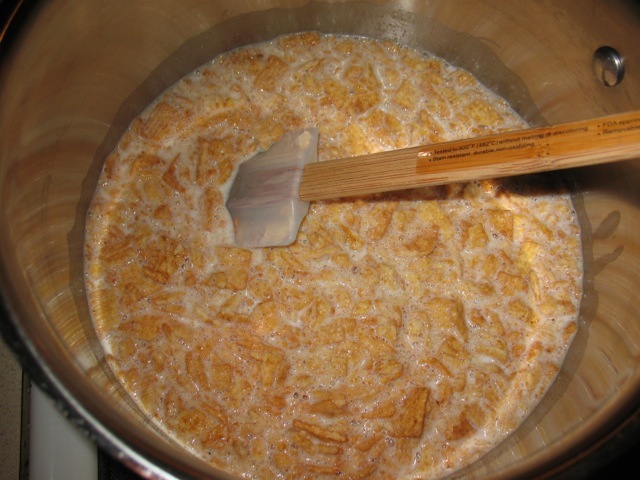 Add cereal milk, cream, sugar and corn syrup to saucepan. Bring to boil and cook at boiling for 4 minutes, watching carefully to avoid boiling over. Remove from heat and gradually whisk in the cornstarch and milk. Return to heat and boil for about a minute, whisking constantly as the mixture thickens. Remove from heat. 4. Slowly pour the hot milk/cream mixture into the large mixing bowl while whisking it to combine with the cream cheese. Set the freezer bag in the ice water and pour the mixture into the bag. Let it cool for 30 minutes and then put it in the refrigerator to completely cool. Process in an ice cream maker following maker's instructions (may not need as much time, given that it's pretty thick). Put in freezer and freeze until hard. A shout out to Southern Maryland on Cook In/Dine Out! This was really good. It occurred to me the other day that milk left over from a bowl of Honey Nut Cheerios would make good cereal milk ice cream. I love both Momofuku and Jeni's. This dessert is so creative and sounds out of this world tasty! Thank you! That's very nice of you. Have you made any Momofuku desserts? I'm really into the corn cookies and would like to try making one of the tall cakes someday.